These are impressive. 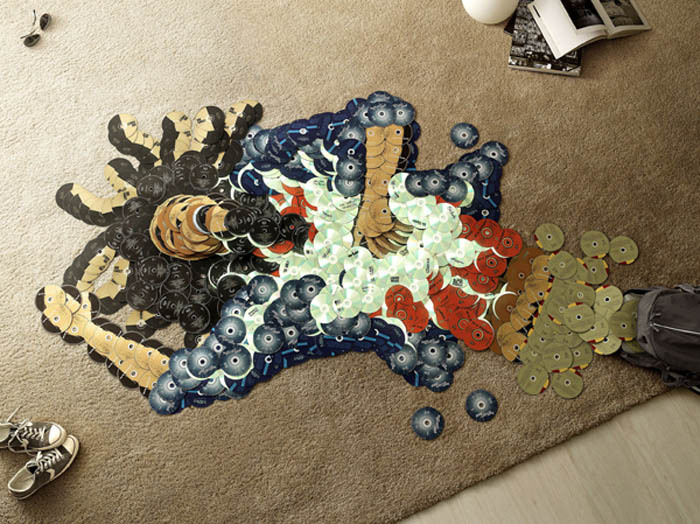 Italian artists/designers Mirco Pagano and Moreno De Turco created these cd mosaics of seven classic deceased musicians for an ad campaign by U.S. ad agency TBWA and also an exhibition. The idea behind the project, titled Piracy, is that musicians are being brought down by internet piracy. The cds used in each portrait are that of each individual musician’s music. The musical artists include: Jim Morrison, Bob Marley, Jimmy Hendrix, James Brown, Elvis, and Michael Jackson. The typographic sculptures of the title are also well done. This entry was posted in Art, Graphic Design, Just Plain Cool, Music, Pop Culture, Stuff We Like, Typography. Bookmark the permalink. Awesome! You are a real artist!!!!!!!!!! Love it! Wow, they look absolutely gorgeous!